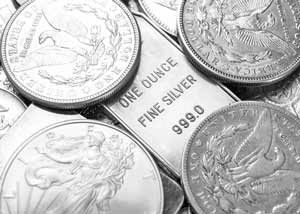 The price of silver struggled in the early part of last week as the dollar gained and stocks retreated. Silver prices gave back about 2.6% in just two days. That would be a short-term blip, with silver quickly regaining all those losses in the next two days. October was brutal to stocks, with major indexes losing anywhere from 11% to almost 15%. By contrast, the silver price was down just 2.4%, while silver stocks gave back about 5%. However, much of that has already been gained back for silver and silver stocks. There's little doubt from the action in both the dollar and precious metals that U.S. midterm elections have some sway on investors, which have sought shelter with these safe havens in the face of political uncertainty. I think the removal of that uncertainty, to a large extent, will take some air out of the dollar, which could help silver continue to rally. 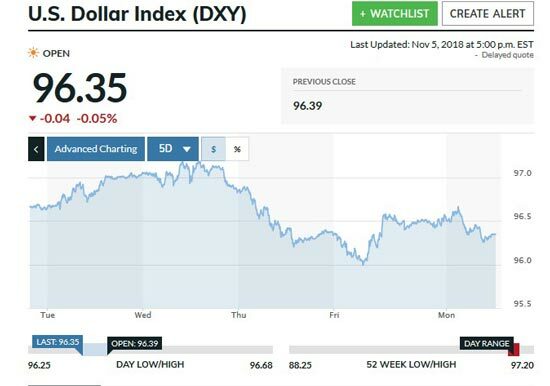 After losing a little ground on Tuesday, especially as the U.S. Dollar Index (DXY) climbed from 96.7 to 97, silver closed slightly down, near $14.35 per ounce. That was actually not bad given the dollar's strength, which pulled it to a level it hasn't reached since July 2017. Wednesday's goblins pushed the DXY to an intraday high of 97.19, and stocks rose. Both of these competed with silver prices, which sold off gradually through the day to end at $14.29. That was unlike gold, which bottomed in the morning then reversed. Thursday would bring strong selling in the dollar, with the DXY losing about 80 basis points. U.S. jobless claims dropped, and the ISM Manufacturing Index came in below expectations. Investors likely factored in a possible slowing in rate hikes, which dented the dollar. As a result, the price of silver jumped to close the day up at $14.65. Friday saw the DXY bottom early at 96 before rallying to 96.5 for most of the day as U.S. equities sold off. Midterm elections likely weighed on sentiment, with the 10-year yield clawing its way up to 3.2%. Silver ended flat at $14.72. On Monday, broader equities rose while tech stocks ended in the red. The DXY was a bit softer near 96.35 and closed at $14.61.